No wonder Italians have a reputation for being so passionate (and are rumoured as perhaps the world’s best lovers) they eat A LOT of aphrodisiacs. A lot. That was one key piece of information that stood out to me on the Roman food tour. When tomatoes were first introduced in to Italy in the 15th century they were initially banned by the Pope who believed their red colour indicated aphrodisiac properties. The food tour was quite possibly the most fantastic gourmand experience of my life. 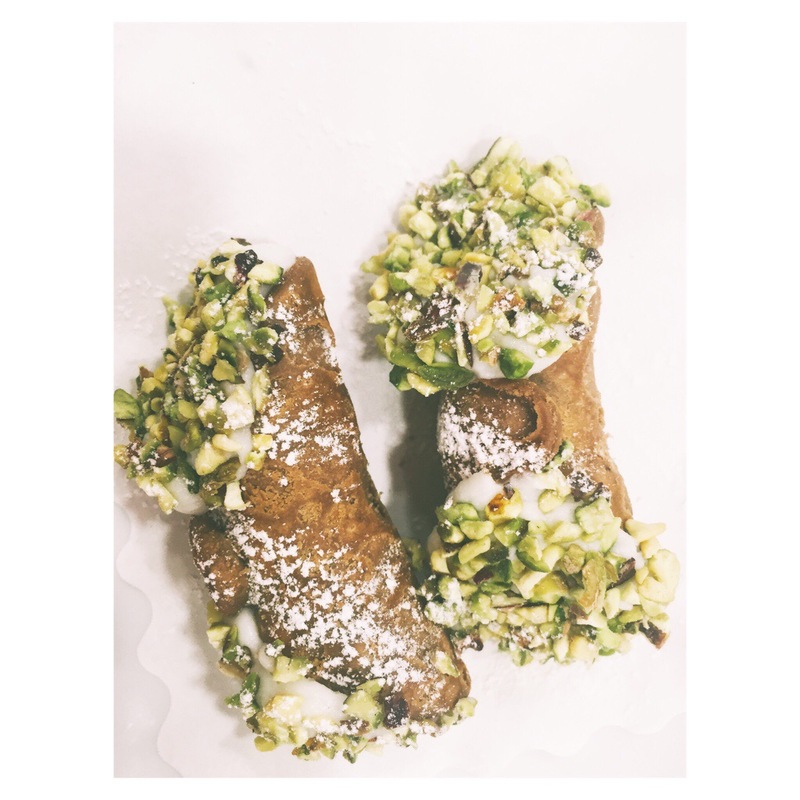 Homemade pistachio coated cannoli at a Sicily bakery. Pizza by the New York Times acclaimed Italian Michelangelo of Pizza. Never ending offerings of wines, prosciuttos, salamis, cheeses, pastas, Caprese and gelato – all from various reputable stops along the way. Like a pub crawl, but I can relive all the key moments intimately. My initial attempt at healthy eating was swiftly banished a few days after arriving in Italy. I was going all Eat, Pray, Love on it. In this case specifically EAT. Time was limited, and so indulgences needed to be increased. Drastically. Gelato everyday. Pasta at least once a day. Sampling of little treaties at all the bakeries along the way. What budget? Luckily the Italians seemed willing to help out. People dined alone, but seemed less autonomous. I often chatted with the elderly man at the table next to me. Or “Come no?” The waitor asked when I declined dessert after a huge plate of cannelloni. “How no?” (I love this phrase!) He brought me a free scoop of Limone gelato anyway. Squares filled in the evenings with locals gathering for their aperitivo – a drink with free tapas to entice everyone to come together and unwind at the end of the day. Us shoe string travellers took the aperitivo a little too seriously. Free food? That was surely an invitation for a dinner feast of epic bite sized proportions. And so maybe not surprisingly the highlight of Italy was most definitely the food. I think what makes it so so so good is the fresh, tasty, rich ingredients they use. As well as the flavour pairing. No matter how much I savoured each morsel I still crave it. But then there was Belgium with chocolate, beer, waffle and French fries heaven. And then I arrived in Bulgaria and a free food tour literally fell into my lap. I was in my very happy place sampling the Greek and Turkish influenced Balkan cuisine. My passionate ramblings led some Danish girls to quickly dub me the Foodie and Vino. I was quite happy with this title I thought as I sipped on my Bulgarian rose liquor.